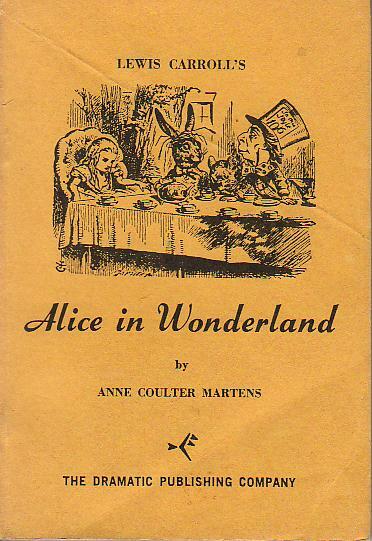 Lewis Carroll’s Alice in Wonderland adapted by Anne Coulter Martens. Published 1965 by The Dramatic Publishing Company. Play for schools based on Alice. Cast: 35 m. and w., doubling possible. As the curtain rises, Alice slides into view at the end of her long fall down the rabbit-hole. It is a more delightful place for the audience than for Alice, who is trying desperately to get back home. She tries to get help from the Mad Hatter, the Rabbit, and from the very nice Cheshire Cat. Long enough to contain the most delightful incidents, it is short enough to keep audience attention. You can see one school’s version on Youtube.